Penny shows audiences how to get more of what they want, whether their deal is worth $100 or $100 million. With her interactive programs, people practice professional negotiation techniques and start using them immediately. As a strategic buyer for a global manufacturing operation, Penny traveled the world negotiating multi-million-dollar contracts. Now she shares the secrets she learned on the job. Penny’s combination of tested techniques and real-life stories connect with audiences on an intense, personal level. Prior to her speaking professionally, Penny, an engineer by education, led a buying team at Amway with an annual spend of $150 million. 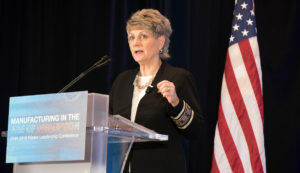 After earning her MBA from Notre Dame she worked with suppliers in Japan, Korea, China, Thailand, Europe, and the U.S. As a project manager for five plants with sales revenue of $170 million, she served as the manufacturing liaison to ensure on-time equipment trials and delivery of finished goods. As an educator and leadership trainer, she’s worked with corporate teams in the U.S., Japan, and Korea. She has also been an adjunct professor of supply chain and negotiation at Grand Valley State University. 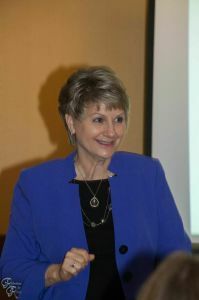 Companies and organizations that have benefited from Penny’s expertise include: Mercantile Bank, Michigan Society of Government Meeting Planners, Calvin College, Society of Women Engineers, and International Association of Administrative Professionals. She has also served on the boards of the Council of Supply Chain Management, Inforum West Michigan Regional Council, and the National Speakers Association/Michigan Chapter. Photographer: David Bohrer / National Association of Manufacturers. We made the right move when we booked Penny Rosema to facilitate the Art of Negotiations Panel Discussion. Her organization and mindfulness kept our panel on track, delivering great value to our members. She maintained the perfect pace with dedicated time for each panelist as well as audience questions. So many valuable insights came to light – this was one of our highest-rated sessions of the conference. I’ve worked with many speakers and I can say that Penny is the ideal facilitator. Her poise, presence, and skillful moderating made this event a success for everyone who attended.